I’ve made a pretty wide variety of sweets for the 12 Days of Christmas series but when I was still in the planning stages for this year’s, I knew that there was one thing I wanted to make that I haven’t yet: a Christmas-themed/flavored layer cake. Layer cakes are a project but I find them worthwhile projects for a few reasons. First, they can feed a lot of people. Second, they make great showpieces. Third, they’re a good opportunity for a baker to create different layers of flavor (pun kinda intended) all in one dessert. My first thought was to maybe do a gingerbread layer cake, but ultimately, I veered away from it. There’s a very narrow difference between what’s really just gingerbread and an actual spice cake. I do think that I can find the sweet spot in that difference but maybe next year. This year I went with something that I knew I could nail in terms of getting those fresh, festive flavors that were undeniably for Christmas. There are three components to the cake, and they’re all pretty easy to make: the sponge, the frosting and the sugared cranberries. The cake batter itself is flavored with cinnamon, ginger and nutmeg, which makes it hit all the warm notes of Christmas spices. If you can get your hands on vanilla bean paste, please do and use it. You’d be surprised the superior taste of it in comparison to regular vanilla extract. My favorite part of it though is the inclusion of whole cranberries that I folded into the batter. While baking, they kinda explode and their juices then bleed, giving the sugary spice cake a pleasant pop of tart sweetness. The frosting has a cream cheese base, both to offset the sweetness of the cake and the orange juice and zest that goes inside. It’s still sweet, but has just enough of a tang from the cream cheese to where the sweetness isn’t overwhelming. Also, yes, there does call for four layers to be baked of the cake itself in the recipe. I can explain that. I left the fourth layer off first because I thought it was a bit overkill(most people struggle to finish a slice of a three layer cake themselves alone), and second because I wanted to make sure that I had enough frosting to cover the three. I did, but just enough. The fourth layer we had plain and actually discovered that it made a delicious dessert even without the frosting. You can eat your fourth layer plain, wrap in plastic wrap and freeze it for later, or cube and use it make trifle or cake truffles. I’ve never made a layer cake and left it ‘naked’ before, but I’ve also never made sugared cranberries before and I have to say I think they give the cake a neat but festive decoration even without extra piped frosting and sprinkles, which is usually how I choose to decorate my layer cakes. As delicious as the frosting is, the cake really doesn’t need the extra amount of it. It’s a fantastic bite that manages to deliver on so many different flavors at once. 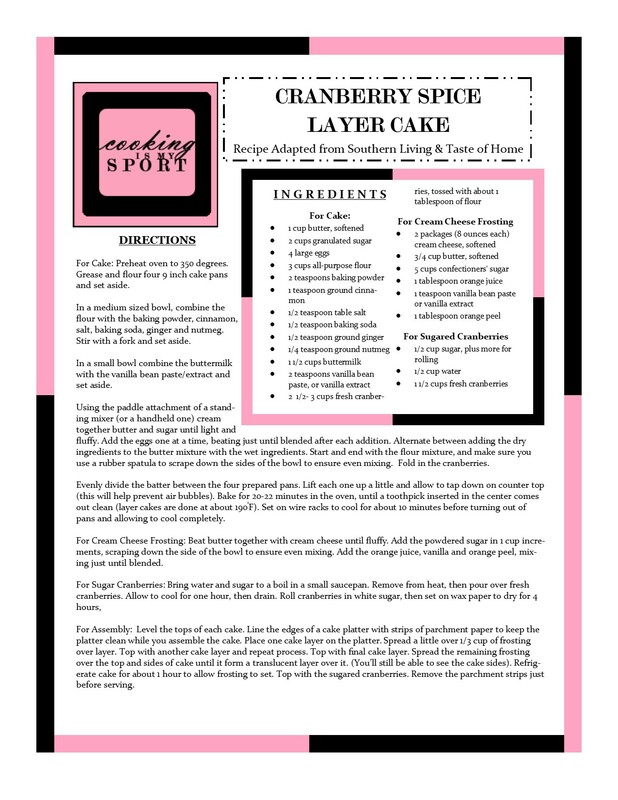 You get the freshness from the citrus, the warm undertones from the spices, the tartness from the cranberries, and the tang from the cream cheese. I just love everything about this cake and if you choose to make it apart of your Christmas dinner, I think you’ll see why. Linking up to Fiesta Friday #202, co-hosted this week by Judi @ cookingwithauntjuju.com and Laurena @ Life Diet Health. For Cake: Preheat oven to 350 degrees. Grease and flour four 9 inch cake pans and set aside. In a medium sized bowl, combine the flour with the baking powder, cinnamon, salt, baking soda, ginger and nutmeg. Stir with a fork and set aside. In a small bowl combine the buttermilk with the vanilla bean paste/extract and set aside. Using the paddle attachment of a standing mixer (or a handheld one) cream together butter and sugar until light and fluffy. Add the eggs one at a time, beating just until blended after each addition. Alternate between adding the dry ingredients to the butter mixture with the wet ingredients. Start and end with the flour mixture, and make sure you use a rubber spatula to scrape down the sides of the bowl to ensure even mixing. Fold in the cranberries. Evenly divide the batter between the four prepared pans. Lift each one up a little and allow to tap down on counter top (this will help prevent air bubbles). Bake for 20-22 minutes in the oven, until a toothpick inserted in the center comes out clean (layer cakes are done at about 190°F). Set on wire racks to cool for about 10 minutes before turning out of pans and allowing to cool completely. For Cream Cheese Frosting: Beat butter together with cream cheese until fluffy. Add the powdered sugar in 1 cup increments, scraping down the side of the bowl to ensure even mixing. Add the orange juice, vanilla and orange peel, mixing just until blended. For Sugar Cranberries: Bring water and sugar to a boil in a small saucepan. Remove from heat, then pour over fresh cranberries. Allow to cool for one hour, then drain. Roll cranberries in white sugar, then set on wax paper to dry for 4 hours. For Assembly: Level the tops of each cake. Line the edges of a cake platter with strips of parchment paper to keep the platter clean while you assemble the cake. Place one cake layer on the platter. Spread a little over 1/3 cup of frosting over layer. Top with another cake layer and repeat process. Top with final cake layer. Spread the remaining frosting over the top and sides of cake until it form a translucent layer over it. (You’ll still be able to see the cake sides). Refrigerate cake for about 1 hour to allow frosting to set. Top with the sugared cranberries. Remove the parchment strips just before serving. Thank you, it really does. the Flavors are fantastic. This looks so yummy and gorgeous. Oh this looks amazing! !😋😍 I saved it as well and can’t wait to make it! Such a beautiful cake! I wish I had one! This looks beautiful and I’m sure is delicious! The sugared cranberries give it a sophisticated and grand appearance. You’re right…this is a gorgeous centerpiece for a table for all to gawk before dinner. Merry Christmas Jess! This cake looks beautiful! Bet it tastes as wonderful as it looks! Oh Jess what an absolutely gorgeous looking cake! The single slice looks so festive, fresh and inviting and the whole cake itself is perfect! I don’t ‘think’ I like cranberries but after seeing this I really want to make it! 😀 Thank you so much for linking and sharing at Fiesta Friday. The trouble is now… where to find fresh cranberries! I haven’t made a layer cake in a long time (I use to make all the birthday cakes) and your cranberry cake with the cream cheese frosting is perfect for holiday entertaining. I candy cranberries a lot – they add a nice touch to any dessert. Happy Fiesta Friday! This was my first time candying cranberries, but I love it–both the taste and how easy it is. Thank you! This cake looks so festive and delicious. This cake is so pretty, Jess! Could you use cake flour instead of regular flour?